The cobbled village streets, the rolling hills, the friendly faces, the delicious food, the list of reasons is endless when we think about walking the Via Francigena in Tuscany. Italy is top of my list when it comes to walking holidays. There is sense of community everywhere you go and local people are excited to share their passion for traditions. Plus, the weather isn’t too bad either with sunshine greeting us in nearly every month of the year. It seems that each village is steeped in mountains of history to discover. 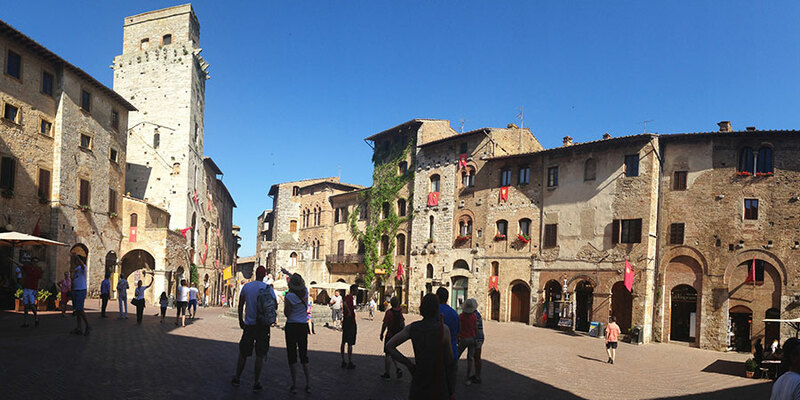 From the 14th century gothic architecture found in Lucca to the expansive squares filled with cafes and bars in Siena, there is somewhere for everyone to indulge in the relaxing Italian lifestyle. Today we share five great reasons to walk the Via Francigena in Tuscany. During the warmer months one of my favourite spots to get a full view of the vast landscape was from the towers of San Gimignano. Here you feel like you have conquered an empire and are sitting on your very own throne. Look down upon the tuscan hills and breathe in the fresh air. Now more than ever we are so used to being constantly distracted by daily noise. Whether it’s the big city lights, the daily commute to work, the screens that fill our days or being surrounded by urban landscapes. In Tuscany you can completely tune out. The small villages and quiet county paths are a welcome retreat from city life. Flavor bursts from every nook and cranny of the narrow Italian streets. You don’t have to go far before you reach a tiny cafe with delicious local produce carefully combined to give us the best classic Italian pasta and pizza dishes. We love everything about Italian cuisine. From the sweet smelling tomatoes to the generous portions of tagliatelle you won’t be short on flavours in Italy. We recommend trying as many dishes as possible. After all you have been walking all day and you deserve a treat or two. As a special treat you can get a taste of the famous Italian truffles in the small town of San Miniato where they will often offer you a shaving of truffle over your pizza. There is a reason why practicing mindfulness has become a common hobby for most people. With our attention taken up by screens and an ongoing feed of news we tend to forget to take time out to think for ourselves. Walking allows us the time to reflect and simply enjoy the world around us. Whether you walk for 1 week or 1 month, everyday is time for you. Some go to get away from it all, others go to meet new people. If you opt for a guided tour you will be walking with a group and an expert guide each day. Guided tours are a great way to meet like minded people and enjoy the camraderie when you are out on the trails. Also, you will find that having someone else who is just as tired as you after a long days walk is a relief. Enjoy having hearty meals and plenty of vino in the evenings as you reflect on your day. For more information about the Via Francigena in Tuscany please contact one of our travel specialists. Hi Denise, it would work just like the tour you did with us in Spain. We have some great tours in Ireland also, see here:https://irelandways.com/ways Let us know if you need some additional information or assistance. were included. Could this happen in Tuscany or Ireland? I’m interested in walking tour about 7 days long in mid to late August ? ?